Oases calculating gross payroll totals and exporting them to a payroll company or department is a 2 minute job – No more burning the midnight oil leading up to the payroll run! Oases collates all the sessions that are approved per staff member per pay period and assigns a pay rate to the session based on the criteria you have set. A personalized student, instructor and subject combination pay rate. A pay rate based on a percentage of the amount billed to a parent for any particular student, instructor and subject combination. A standard pay group containing pay tiers – pay groups allow you to set a pay rate for each session type and pay tiers use a different pay rate for each session based on the number of students in the session and how long each was there. A standard pay group with minimum pay – use the pay group to guarantee a minimum payment for certain types of sessions. Use pay override in the session when more than one student is in attendance for special circumstances. You may also use all of the above in any combination at the same time to cope with your, ‘if this then pay that scenarios’! Manual adjustments and bonuses may be added before closing out the gross totals and exporting your payroll information. 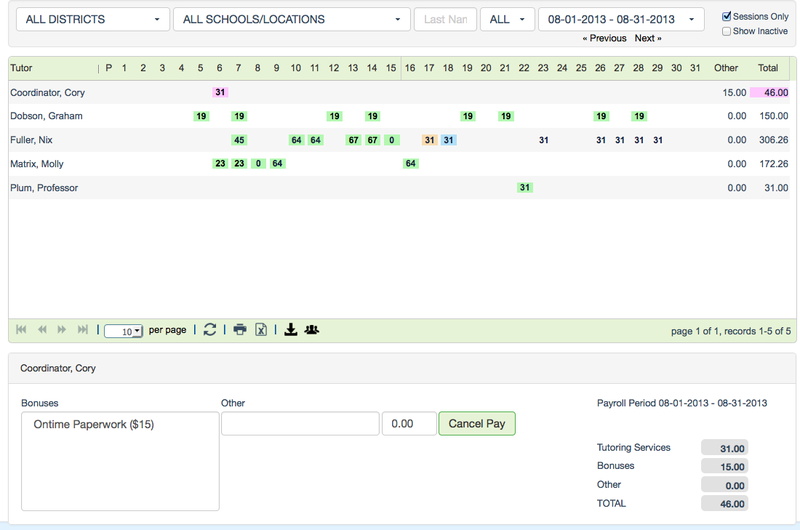 Sessions that are not approved in time to make the cut off date are carried forward automatically by Oases and added to the next available payroll period. We provide custom export formats for all the major payroll processing companies or a straight export to excel. Oases is able to quickly, easily and efficiently handle your payroll needs and all of this is enabled with just a few clicks of your mouse! Cory’s payroll is already closed out and includes a bonus. Everyone else is waiting for after August 29th for all sessions to be complete and approved. Color protocols indicate the status of each session in the approval process.